Primarily Primates is a non-profit sanctuary partnered with Friends of Animals that operates to house, protect, and rehabilitate various non-native animals. The private refuge currently houses several hundred nonhuman animals, and, as the name implies, focuses primarily on caring for apes and monkeys. Many are cast-offs from the pet trade and biomedical research institutions who have suffered greatly for most of their lives, but now have a safe place to call home. 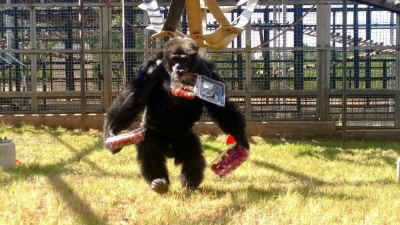 One of the unique aspects of Primarily Primates are the enrichment activities that staff members and volunteers organize for the animals. Activities include festive culinary events, playtime with plush toys, gift wrapped boxes filled with treats, and much more. This picture of Deeter, a thirteen year old chimpanzee, perfectly exemplifies the positive effects Primarily Primate’s enrichment programs have on the lives of the animals who reside here. This particular afternoon, Carestaff Supervisor, Joseph Leija, had presented a wheel-barrel that had been filled with a variety of donated produce from Costco. Deeter sat with Joseph and pointed out the produce that he desired and happily walked off with boxes of strawberries and tomatoes.